Hello lovelies! So Guess what!?! Hubby is staining the floor this weekend (pictures will soon follow) and we are on official spring break this week! Can I get a WOOT WOOT!! I love homeschooling, but this Momma needs a break. I am beyond excited for a little time off. I plan to craft everyday and read a few good books. I have a mental checklist, which Hubby thinks is very dorky. I totally embrace my dorkiness:) Infact I pretty much rock out to it. 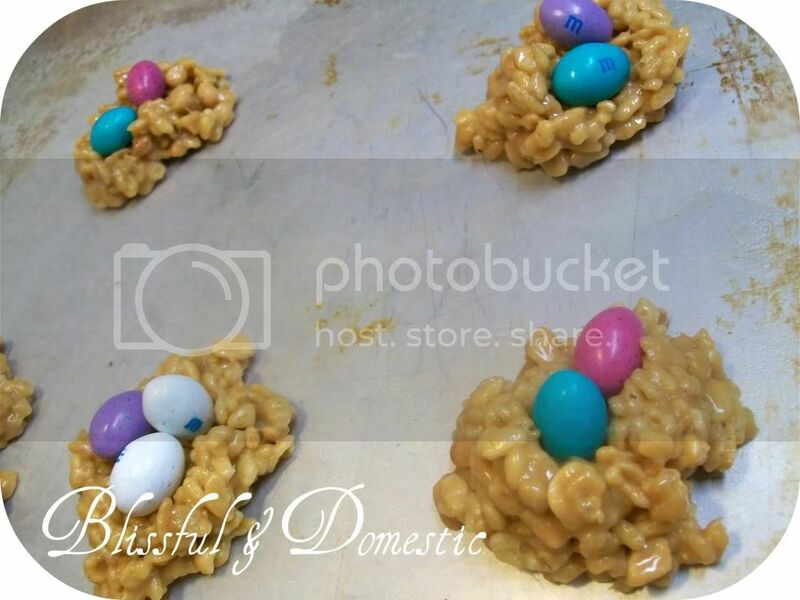 So while I head off to read Catching Fire (I heart Hunger Games Now), here are two simple Easter recipes to make with your family. I decided to posts the recipe here, since I changed it just a smidge. Bring syrup and sugar to a boil. Stir in peanut butter. Remove from heat. Add cereal. Drop by spoonfuls on waxed paper. Push the candies into the center to create little nests. My littles loved this. Keagan even said he would love it without the candies. 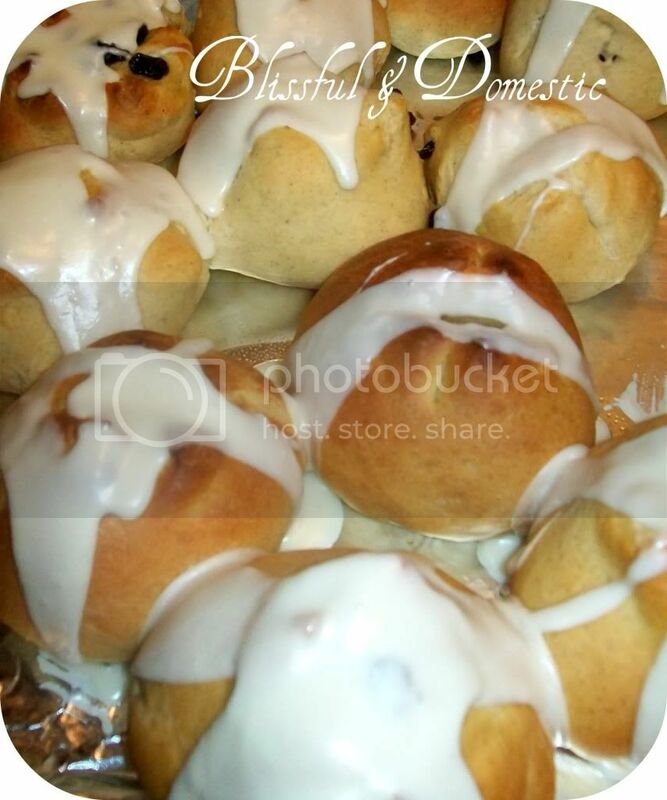 I think next time we make these I will add raisins or craisins. They were so yummy! This recipe is for the bread maker. Break 2 eggs into 2-cup measuring cup. Add enough water to measure 1 1/3 cups. Measure carefully. Place egg mixture and remaining bun ingredients, except raisins, in the order recommended by the manufacturer. Add raisins at the Raisin/Nut signal or 5 to 10 minutes before last kneading cycle ends. Remove dough from pan, using lightly floured hands. Grease cookie sheet. Divide dough in half. Divide each half into 8 equal pieces. Shape each piece into a smooth ball. Place about 2 inches apart on cookie sheet. Snip a cross shape in top of each ball, using scissors. Top with a bad of butter on each roll. Let rise in warm place about 20 minutes. Heat oven to 375°F. Bake 15 minutes or until golden brown. Remove from cookie sheet. Cool slightly. In medium bowl, mix all icing ingredients until well blended. Stir in additional milk, 1 teaspoon at a time, until smooth and spreadable. 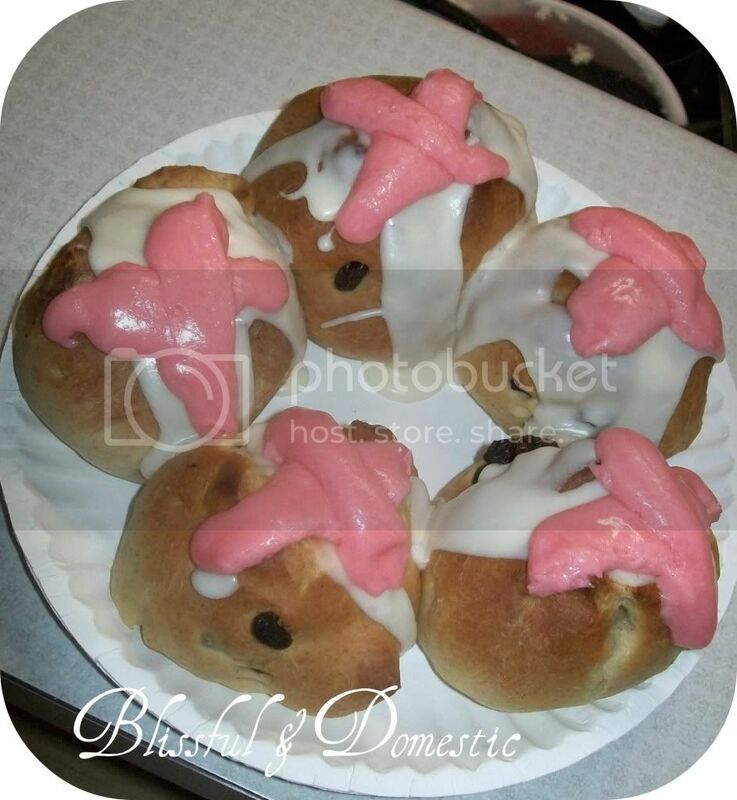 Make a cross on top of each bun with icing. I had a little trouble with this, but it absolutely did not affect the taste. They were very yummy! Serve them warm and Enjoy! 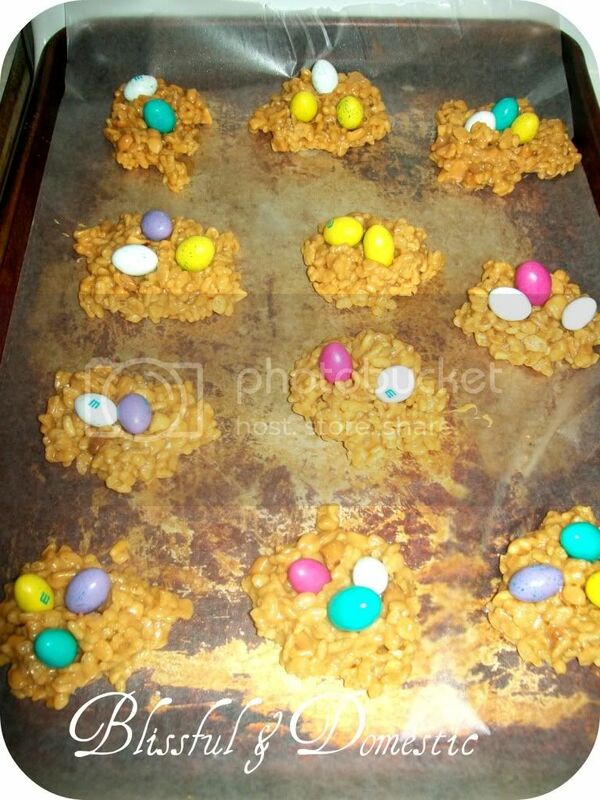 Those nests look so yummy, I might have to make some! Hi Danielle, Thanks for stopping by, it's so nice to meet you! I'm happily following you too! Staining the floor?? I can't wait to see! Those nest are so cute and look yummy.